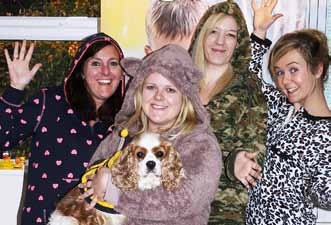 The Waterland Media team supports Children In Need with ‘Onesie Wednesday’. Members of the Waterland Media team raised £250 for Children in Need and earned themselves a mention on Radio Two as part of a Onesie Wednesday fundraising initiative. Pictured from left to right, Lisa Minall, Beth Connor, Tara McEniry, Ashleigh Mackenzie and Charlie, the office pooch, all donned one-piece suits for the special day. “We had such fun and could not believe it when we got a prominent shout out on the Ken Bruce radio show,” commented Ashleigh Mackenzie, assistant editor. “But most of all we are just proud to have done our bit for a worthy cause,” she added. Promoted heavily by the BBC, The Children In Need appeal went on to break the £31 million mark this year.